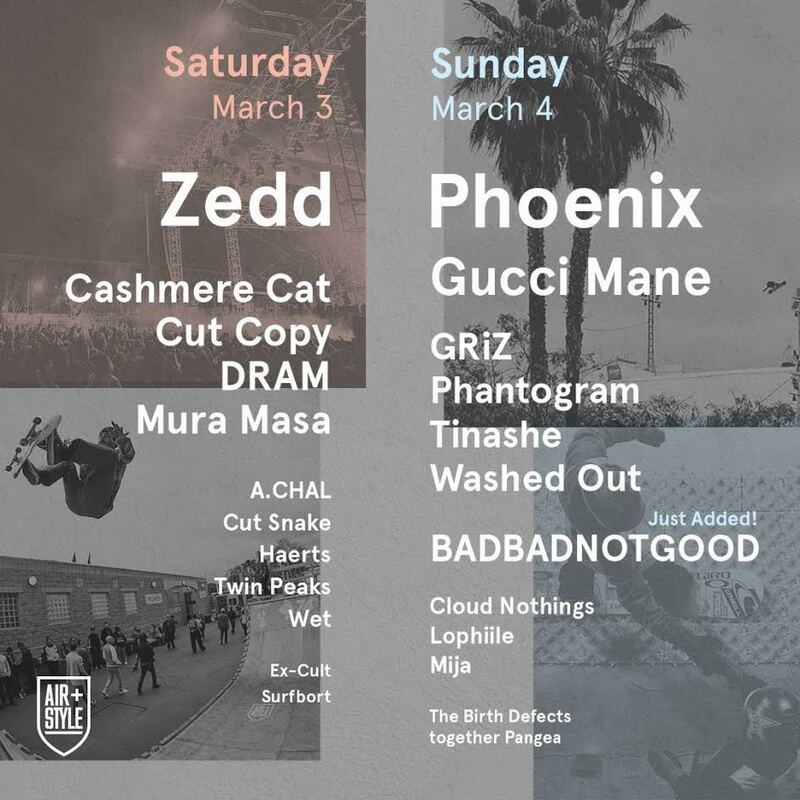 Sean White's Air + Style 2018 featuring Phoenix, Zedd, Gucci Mane and more!!! If you’re anything like us at Listen SD, then you’ll want to know everything there is to know about an event as majestic as Air + Style 2018 promises to be. Air + Style’s scintillating lineup features a host of established indie favorites like Phantogram, Washed Out, and Cut Copy, while also covering hip hip, rap, R&B, and EDM with Gucci Mane, DRAM, Tinashe, and Zedd all scheduled to appear. Rounded out by irresistible headliners Phoenix and even more tasteful choices like Cloud Nothings, BADBADNOTGOOD, and Cashmere Cat, this growing festival has made its case as one of the most promising events of the new year (eat it, Coachella). In past years, Air + Style’s lineup has never failed to impress, with celebrated acts such as Kendrick Lamar, Incubus, J. Cole, and the Flaming Lips having graced the festival stage. This year’s impressive mix of artists, however, seems to offer a little something extra in terms of diversity. With a serendipitous mix of styles that spans every genre from chillwave to R&B, rap to hard rock and back again, this lineup’s staggeringly varied and carefully chosen group speaks to the curators’ direct understanding of the playlist-oriented taste of its demographic. This year’s incarnation of Air + Style doesn’t disappoint in the fine print. Instead, it simply offers something for lovers of any genre to discover. Artists like Twin Peaks, Together Pangea or Mura Masa may be new to the vast majority of attendees, but their bookings offer unique chances for open-minded fans to come away with a new record or piece of merch, not to mention to the visceral experience of seeing them perform live for the first time. For those who want to stick with what they know, there’s also Cut Copy, Washed Out, Phantogram, and Phoenix, among several others. Situated in the heart of South L.A. on the historic U.S.C. campus, Exposition Park is the indelible site of Air + Style 2018 as well as acclaimed festivals like FYF Fest and Camp Flog Gnaw. Even for those native to Los Angeles, this site can feel like a vacation spot, with easy transit options for traveling to and from the venue via the Metro Expo Line. From French heroes Phoenix’s undeniably satisfying pop grooves to BADBADNOTGOOD’s freeform jazz explorations, Air + Style has something for pretty much every fan of live music to enjoy. Bask in the glory of chillwave’s most innovative sonic artist, Washed Out, or get down to some sultry grooves from Tinashe. It’s your weekend, choose your own adventure! You can purchase tickets to Air + Style 2018 HERE. Huzzah! The fourth incarnation of Air + Style music festival & action sports showcase is set to hit Exposition Park in downtown L.A., taking place this March 3-4.